Julie Taymour was the director of Across The Universe. She was chosen for her creativity and dynamic visual style. I was hired by FX Cartel to help develop some of the more hallucinogenic effects in several of the musical numbers in the film (including Bono’s rendition of “I am The Walrus”, and Selma Hyak as the bang-bang-shoot-shoot nurses). Julie Taymour is widely known for directing the stage musical, The Lion King, for which she became the first woman to win the Tony Award for directing a musical, in addition to a Tony Award for Original Costume Design. She was also the director of the Broadway musical Spider-Man: Turn Off the Dark. Taymor has also worked in film, directing Titus (1999) and Frida (2002). Both movies received positive reviews for their stylish filming; Frida was the more acclaimed of the two, garnering Oscar nominations in six categories and winning in two (Best Makeup and Best Original Score). In November 2008, Taymor directed a film version of Shakespeare]’s The Tempest, released in December 2010. With a collection of 35 Beatles songs, Across the Universe is a 1960s love story set to the music of The Beatles, and featured performances by Bono, Joe Cocker, Eddie Izzard and Salma Hayek. Taymor both directed and co-wrote the story for the film. 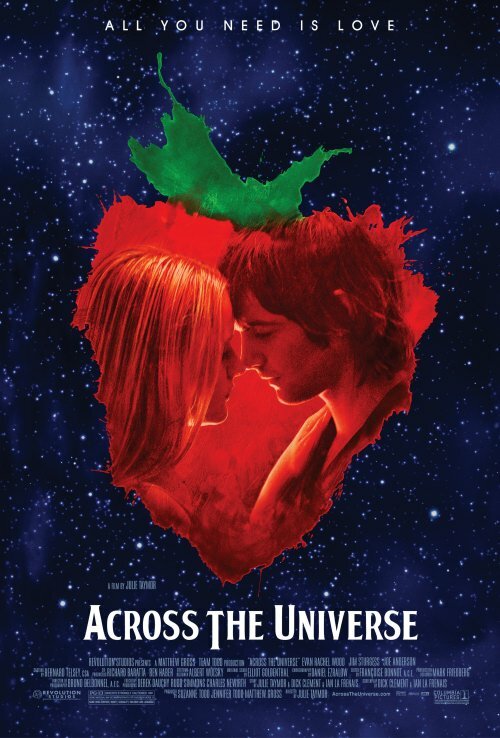 Across the Universe received a Golden Globe nomination for Best Musical/Comedy as well as an Academy Award for Costume Design. Posted on Monday, December 5th, 2011 at 9:02 pm. Filed under: Uncategorized	RSS 2.0 feed.